It's a new year, kinda anyways. New things are happening all the time. New days, new seasons, new mergers. And according to OPM, new games as well. 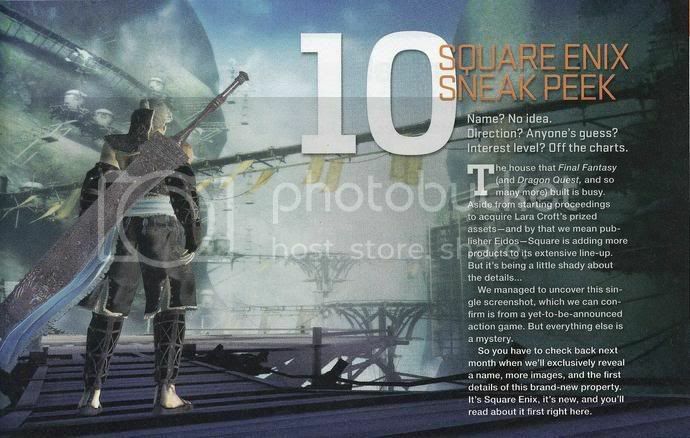 The above is a scan from this month's Official PlayStation Magazine, detailing a feature for the next month's issue of an as yet unannounced SquareEnix game. I think it's going to be that FFVII and Tomb Raider cross over we were all hoping for. i dunno, but im buying it... looks sick! Maybe its their new MMO? I'm already bummed because its being discussed in OPM and not NintendoPower!